Adult heart muscle is comprised of cells called cardiomyocytes. Most cardiomyocytes don’t replenish themselves after a heart attack or other significant heart muscle damage. The UT Southwestern researchers were able to devise a new cell-tracing technique, allowing them to detect cells that do replenish themselves after being damaged. “We identified a cell that generates new heart muscle cells. This cell does not appear to be a stem cell, but rather a specialized cardiomyocyte, or heart muscle cell, that can divide, which the majority of cardiomyocytes cannot do,” said Dr. Hesham Sadek, Assistant Professor of Internal Medicine and with the Hamon Center for Regenerative Science and Medicine. Previous research by UT Southwestern scientists revealed that it is the highly oxygenated environment of the heart that prevents most heart muscle cells from dividing. The researchers reasoned that the cells that do divide must, therefore, be low on oxygen, which is a condition called hypoxic. They then devised a technique to identify and trace the lineage of hypoxic cells. That technique led them to the identification of the proliferating cells within heart muscle. “For decades, researchers have been trying to find the specialized cells that make new muscle cells in the adult heart, and we think that we have found that cell,” said Dr. Sadek, senior author of the study, which appears online in Nature. Traditional fate mapping, which is somewhat like developing a family tree for cells, labels cells based on the expression of a certain gene. That didn’t work for the hypoxic cells, which are mainly regulated at the protein level rather than the gene-expression level. Instead, the researchers developed a sophisticated protein-tracking technique based on the presence of a hypoxia-responsive protein called Hif-1alpha. Researchers developed a genetically modified mouse in which the Hif-1alpha protein is fused to another protein, called Cre recombinase, which could then be used for cellular labeling. “This fate-mapping approach, based on protein stabilization rather than gene expression, is an important tool for studying hypoxia in the whole organism. 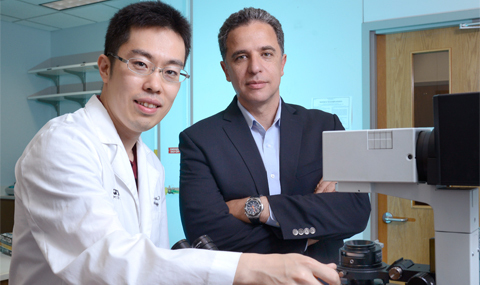 It can identify any hypoxic cell, not just cardiomyocytes, so this has broad implications for cellular turnover in any organ, and even in cancer,” said Dr. Sadek, whose lab focuses on cardiac regeneration and stem cell metabolism. Other UT Southwestern researchers who contributed to the study are Dr. Wataru Kimura, Assistant Instructor in Internal Medicine; Dr. Feng Xiao, postdoctoral researcher; Dr. Diana C. Canseco, Assistant Instructor in Internal Medicine; Shalini Muralidhar, former postdoctoral researcher; Yezan Abdulrahman, postdoctoral fellow; SuWannee Thet, research associate; Helen M. Zhang, research assistant; Dr. Rui Chen, former Assistant Professor of Internal Medicine; Dr. Joseph A. Garcia, Associate Professor of Internal Medicine; John M. Shelton, senior research scientist; Dr. James A. Richardson, Professor of Pathology, Microbiology, and Plastic Surgery; Abdulrahman M. Ashour, research assistant; Dr. Asaithamby Aroumougame, Assistant Professor of Radiation Oncology; Hanquan Liang, computational biologist; Dr. Chao Xing, Associate Professor of Clinical Science; Dr. Zhigang Lu, research associate; and Dr. Cheng Cheng Zhang, Associate Professor of Physiology and Developmental Biology. The research was funded by grants from the National Institutes of Health and the Foundation for Heart Failure Research, N.Y.